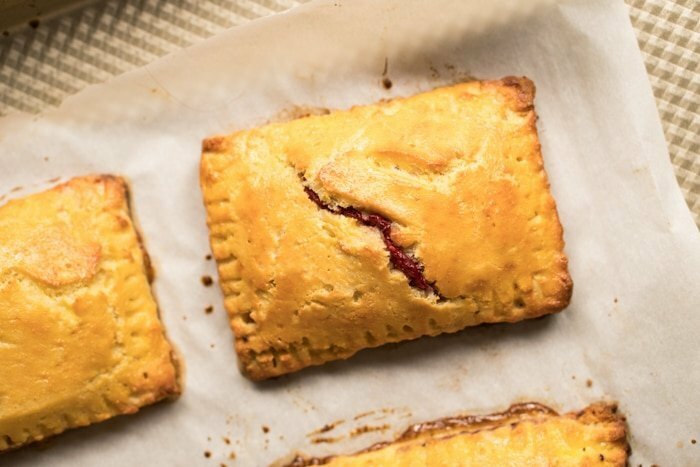 These strawberry gluten free and keto pop tarts are simply just. sooo. good! 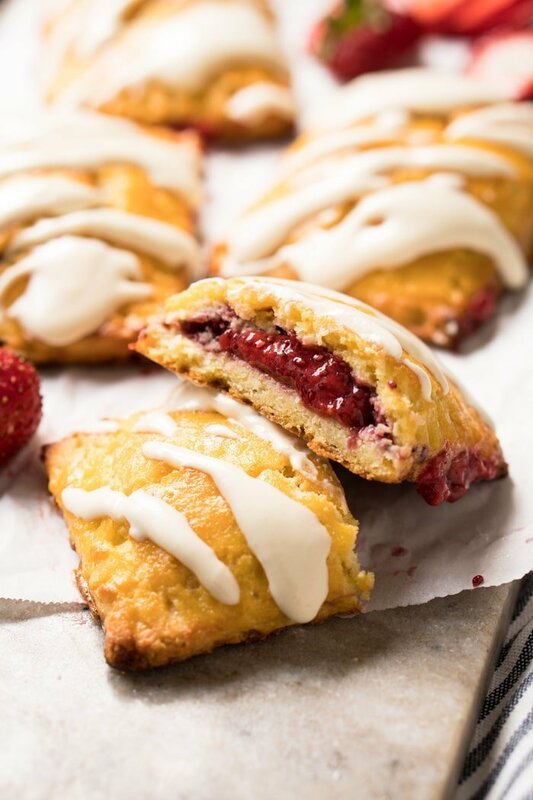 The crust is buttery, tangy and flakey, while the strawberry filling is pure summer delight! 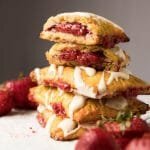 Strawberry Gluten Free & Keto Pop Tarts i.e. Toaster Pastries! OK, so you can definitely call these guys hand pies too. But since they’re majestic lightly toasted and topped off with a cheesecake glaze, I’m totally dubbing them keto pop tarts. And seriously don’t skimp on the cheesecake glaze, it rounds up beautifully these gluten free toaster pastries! Bonus: they’re very filling! So you can easily get 8 smaller ones out of a batch of dough, bake them up, freeze, and pop in the toaster as needed. Many of you already know and love our gluten free & keto pie crust. Suuuper flaky and a breeze to make, we’ve already used it anywhere from keto empanadas to quiche. The one trick is to work quickly and in a cool place. And if at any moment the dough feels unmanageable, simply pop it in the freezer for 10-15 minutes. And do keep in mind that as the filling expands while baked, it will crack your pastry slightly. Honestly don’t sweat it, as the only way around this would be to increase the xanthan gum to make up for the lack of gluten. But that would mean less flakiness, and I’m just not into sacrificing taste and texture for looks. For the strawberry filling, you’ll essentially be making our sugar free and keto chia jam. 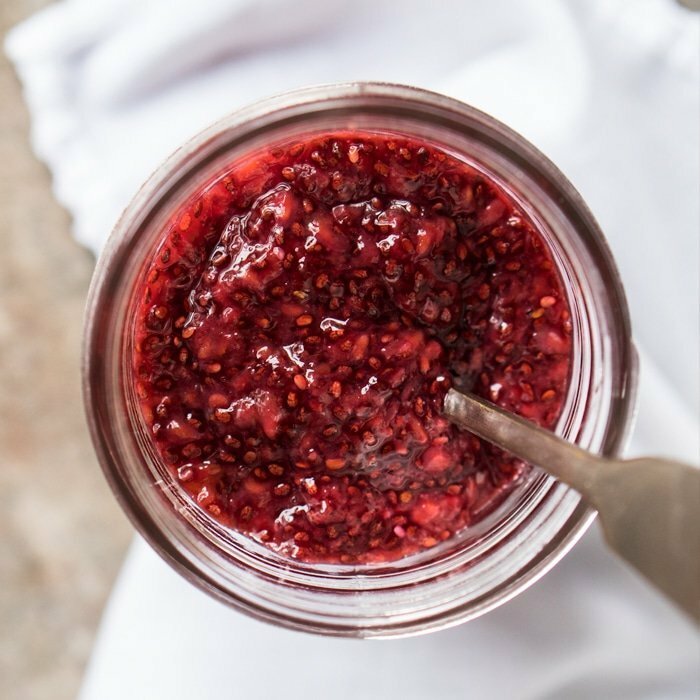 The chia seeds are an awesome way of adding extra fiber and nutrients to your favorite berry jam, while thickening up the lot without the need of extra sugar. And I also like to add a handful of raspberries to liven things up a notch. But you can always do all strawberries, or any berry of choice really! The batch also makes a little extra than what you need for the pop tarts themselves. But trust me, you’ll want to have it around. It’s awesome with a little yogurt and even with chia pudding (doubling up here!). One of the beautiful things about these keto pop tarts is that very little sweetener is needed (if at all!). If you’re using fresh summer strawberries and been on the keto diet long, you might be pleasantly surprised that no extra sweetener is needed. But if your berries are a little tart, you’ve got options here. You can use erythritol (you guys know Lakanto is my fav! ), allulose and xylitol. If just grain free, coconut sugar is your best bet here. And of course, raw sugar works great too. If you’re opting for the cream cheese glaze, which comes highly recommended, just be sure your sweetener is powdered (allulose and xylitol arguably give less aftertaste). Or you can always grab a bag of powdered erythritol (Lakanto!). 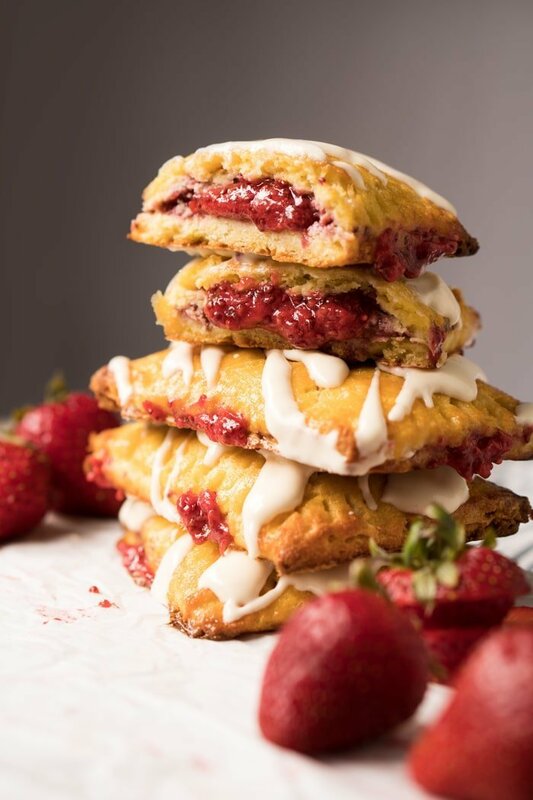 These strawberry gluten free and keto pop tarts are simply just. so. good. The crust is buttery, tangy and flakey, while the filling is pure summer delight! Cook your strawberries and raspberries in a saucepan over medium heat until they begin to break down, about 5 minutes. Stir in the lemon juice and sweetener of choice (to taste). Mash it down or leave it chunky. Cook for 5 more minutes, remove from heat and stir in the chia seeds. Let stand until it begins to thicken, adding water if needed to thin out until desired consistency is reached. 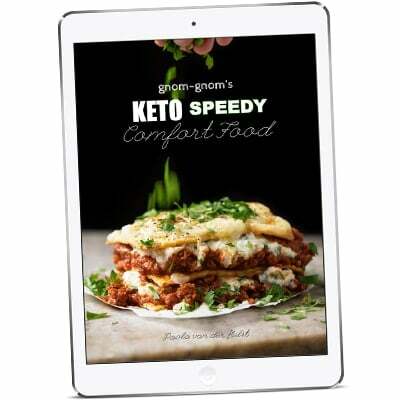 Allow to cool to room temperature and store in an airtight container in the fridge for a week or two and in the freezer for up to three months. Watch the recipe video below for guidance! Make a batch of our super flakey pie crust and chill while the strawberry jam is setting. I also highly suggest you add a teaspoon of orange zest to the crust! Preheat oven to 400°F/200°C. Line a baking tray with a mat or parchment paper. Roll out pastry dough in between two sheets of parchment paper, lightly dusting with coconut flour as needed. 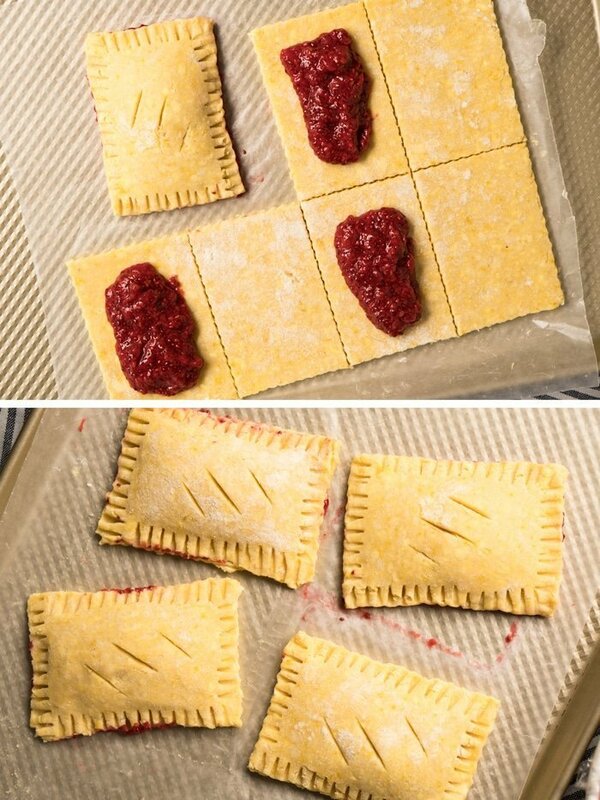 Cut into desired size (I suggest making 8 pop tarts, as they're very filling!). Brush edges with egg wash and spoon a couple tablespoons of the chilled chia jam. Press edges together and press down with a fork. If there are any cracks, simply pinch the dough together. As with regular pie crust, try to work quickly or put your dough back in the fridge for 15 minutes if it begins to warm up too much. Place pop tarts in prepared tray, cut a few slits on the top with a sharp knife, freeze for 15 minutes, brush with egg wash and bake for 20-30 minutes, until golden all over. Baking time can vary a lot form oven to oven, so be sure to check in on them at minute 10. Allow to cool for 10 minutes before serving. 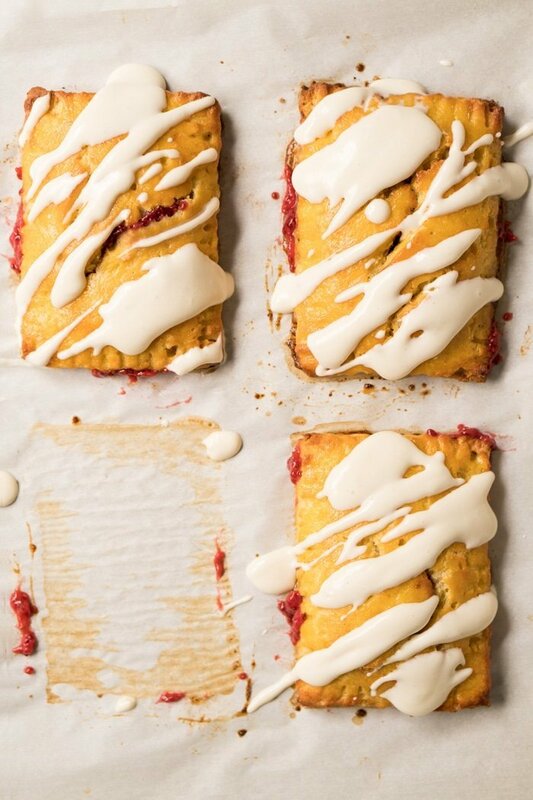 Make the glaze while the pop tarts are cooking by creaming together with your mixer the cream cheese, butter and powdered sweetener until light and fluffy. Add in the vanilla extract, salt, and adjust texture to taste with a teaspoon of milk at a time. Keep in mind that unless you add a lot of sweetener, your glaze won't set completely. Store them unglazed, in an airtight container, at room temperature for 2-3 days. Alternatively you can freeze them unbaked or baked for about a month. Bonus: they're very filling! So I honestly suggest whipping up 8 smaller ones out of a batch of dough. You can also freeze them unbaked (always best), or baked (you lose a bit of flakiness, but they're very handy and you can just pop in the toaster as needed). Also note that the nutrition facts were estimated for the crust with the filling and glaze. But nutrition values (carb wise!) can vary widely here depending on the amount of berries you use. Hello, my wife is allergic to almonds do I have to use almond flour or do u have a measurement for coconut flour only? You can totally skip it xo! I made these earlier this week and I will say they’re very tedious to make, and because I’m not a baker (amateur at best) it took some time and fenaggeling. I gotta say- they were absolutely delicious. I missed the order in operations I accidentally put the egg wash on them then baked them- they still turned out absolutely delicious. I would definitely make them again. I’d also recommend to keep them at room temp and scarf them down in a day or two because they get stale and don’t taste as crispy as you may want if they’re not fresh. This is probably #2 on my favorite sweet keto desserts of all time (so far!). Hi Paola! This recipe looks amazing, but I am highly allergic to chia seeds. Any suggestions for it’s replacement? Wow! These are so delicious but I must say working with this dough was so frustrating and seemed to take forever just to make a few at a time. 🤦🏻‍♀️ I finally just gave up and made a galette. 😁. How do you reheat these if you do not have a toaster? will they burn if placed back in the oven? I’m planning to make a batch and freeze half, unbaked. Can I bake the frozen ones directly out of the freezer (same temp?) or do I need to thaw them first? Hi Diana! You can bake the straight from the freezer, you’ll just need to add more baking time same temp! How much longer will vary, but just bake them until golden 😉 xo! * it’s easier to not roll out all of the dough at once. break it in half or quarters. Or, better yet, take a small ball of dough, roll out a circle, and make a half-circle empanada shape. A half circle means no cut off dough on the sides. * when she says use coconut flour as needed, DO! Dust it all over to make the dough easier to handle. You don’t want it sticking too badly to the parchment paper. * It can help sometimes to flip a bit of flattened dough (in the parchment paper) to peel off the top layer and give a dusting of coconut flour, you want to be able to scoop it up once shaped. * it’s ultimately pretty forgiving, I had a few very ugly ones that ripped open a bit and they still baked just fine. Made these, taste delish! But my pastry wasn’t really flaky but more crumbly? Was fine but not sure if that was correct. I used standard ground almonds also called flour but it wasn’t very fine, might that be the problem? Anyway, this was my first v3nture into keto baking so still really impressed! Bought your book and can’t wait to cook some more out of it. Hi, do you have to add the chia seeds? I’m not a huge fan of them. She has a bagel recipe – in case you haven’t found it yet. If you have sugar free strawberry jam sweetened with Splenda, can you just heat it up and add the Chia seeds and perhaps a little water to get the right consistency and fiber?? Didn’t want to heat up the kitchen making jam, it’s supposed to top 100* today! Whaaat?! Can you please send some heat over to Mexico City?! I’m wearing a turtleneck lol! Where can I find the xylitol powder. I seem to only see the regular crystal sugar on Amazon. Hi Patrycja! I just run it in my (very dry!) bullet/blender to powder it 😉 xo! I am very glad to have stumbled upon your site. I have struggled with my weight for quite a while and when I hit 285 pounds decided it was a time for a change. After a lot of research, I decided to go on a ketosis diet and am glad to say 6 weeks later I have lost 30 pounds. Now that being said I am a pop tart fiend and lived off them through college. I am most excited to try your recipe as they seem yummy. I’ve used your pie crust for hand pies before and it’s excellent! I’m going to try these next with the chia jam as I did notice that the berries alone can make it a little soggy. I’m assuming also the lack of sugar to caramelize it? Such wonderful recipes thank you! Hi Janine! Awesome to hear you love the pie crust! And yes on the berries, you want to make sure they don’t leak while cooking or they’ll make your crust soggy. xo! OMG these look so good!! All of your recipes do. 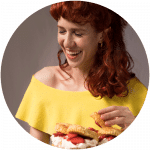 I was diagnosed with Celiac Disease last October and thought I’d never enjoy eating again. Can’t wait to try these!!! Oh lol I get you COMPLETELY! I lived off rice for the first too weeks after I was diagnosed with Celiacs… little did I know ;)! Hope you love the recipes Stella!